Where Did You Get It? E3 direct from PowerA! Thanks!! 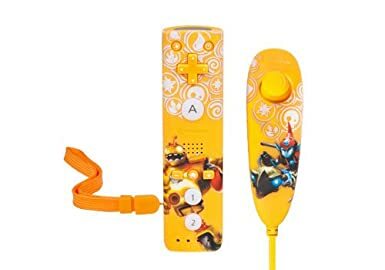 You have already seen the GamePack and Travel Tote...Once you get your Skylanders where you are going, you need a way to play with them...Why not bring the characters you love into your controller? PowerA set up the Pro Pack Mini with a lot of "little things." First off, we have a selection between Blue and Orange...Both Giants sets feature Bouncer on the MiniRemote and Fright Rider on the secondary controller. The Action Buttons (A-1-2) have all been enlarged for easier control and precision...On top of that, they light up! This was very cool feature, and something I was unaware of...They actually illuminate quite well. In the video I showed this by highlighting Fright Rider, but I also used the light to flip the lights back on and not the fan! I think it is a great pairing for those that enjoy playing with the GITD Portal with the lights out! It is almost as if it is a bridged connection between you and the Giant or LightCore Skylander! While the video rendered, I played around with it on WiiU and despite being really hot and humid my hand never sweat...The crispness and quick return of the buttons and control stick on the nunchuck are indicative of quality. All-in-all I am very impressed and stoked to have what will serve as a stand alone controller for the WiiU! This will save me from having to sync and re-sync controllers every time I switch consoles...Plus with the unique artwork and textured grip I will be able to keep the controllers straight. 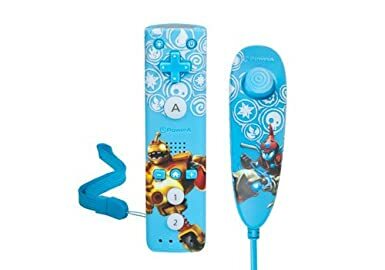 If you are in the market for a quality and exciting Wiimote and Nunchuck replacement, or additional controllers I highly suggest you consider this set from PowerA! I can also tell you the SwapForce controllers are coming and look awesome! Be sure to skim back a few posts to catch them in the E3 video!